Let me talk back to Albion skin care method. The method is called as “4 steps method”. OK. Showing you what they are each. They are from Makeup Remover and Face Wash. I had mentioned how important hygiene is, and the way to use oil makeup removers. ・Beauty tips — How do you remove your makeup? Do you makeup? I know most of our audiences are love to makeup every day. I also know the other are not makeup. But how about sunscreens?? You may use sunscreens. Aren’t they waterproof or water resistance, are they? If they are those, my recommend is using Makeup Removers first, and Face Wash second. This face wash is “liquid”. There are paste, powder, milk etc. Excluding enzymatic face washes (like Papawash), as long as you can make rich bubbles, they are good, I am sure. I may explain about those things later, when my skin condition was super bad, I applied powder foundation only. Sometimes I wear sunscreens which has no effect of waterproof/ water resistance. When those days, I use face wash only. When I use makeup removers, I always use face washes. This is called as “double wash”. The purpose is rinse well makeup removers. After removing makeups, creams are oily, and oil removers are not oily, but I feel uncomfortable. In my experience, I do not recommend those products “you can remove your makeup too” things. They are too strong as face wash, or they are often too weak to remove my makeup. Anyway, the section of “wash” is not unique as Japanese Skin Care method. And you may worry about “double wash” method will bring your skin drier. When you take away from your skin moisture by washing, why don’t you add and wrap? The most uniquest part of Albion method is Step 2 & Step 3. Milk (emulsion) first, and lotion second. I may tell you later, but shortly to say, Japanese skincare method is pouring water by lotion (really watery lotion), wrapping by emulsion or cream (oily things) to avoid evaporation. So, the step is Wash-Lotion-Emulsion (or cream). Albion’s method is unique: 4 steps of Wash-Milk-Lotion-Cream/ Serum. Have you heard about “pre-lotion” items? It is opening route to pour your lotion. Albion’s milk (emulsion) is that kind of product. And Albion recommends to use cottons to use their milk. The purpose is removing the things avoid lotions are going into. It is the effect of “wiping” by cottons. If you have use makeups, are you really sure with removing your makeup perfectly? Are you sure you could rinse perfectly the makeup removers? Recently, I am really in love with using Albion milks (and Cosme Decorte AQMW is the same method). It moist my skin pretty well. Albion is producing nice lotions. But not pretty much unique. Just a usual “most well” products. Ah, so far, there are no stinger for me. And for dry skin (like me), are you sure with your water and oil conditions? When I visit my dermatologist (in Spring, I had super bad condition) told me that “add water, and less oil”. Camellia Oil or other skin care oils are good (I like Horse Oil), but do not forget to pour water on your skin! I asked the BC of Albion how do I do when I wanna use Albion Skin Conditioner Essential. She told me that Milk first, Skin Conditioner second, and something wrap. You can change Skin Conditioner Essential and other Albion lotion morning and night as you like. In person, to my damaged skin, Skin Conditioner Essential gives me too pain to keep using. After lotion, you need to wrap avoiding evacuation. In Japanese method, it is often by Emulsion. But according to the BC of Albion, Albion milks has no effect of wrapping. So, you need something to wrap. Albion sells Cream & Serum. You do not need to buy both Cream and Serum. You can choose one. If you like using creams, choose cream. If you do not like creams, choose serum. Me? I often combine with other products with Albion. I am using their emulsions. But they are also attractive. OK, let me show you what I was showing. 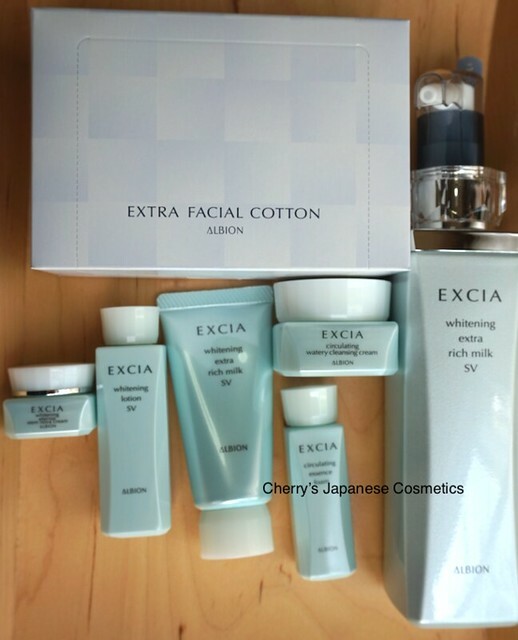 The mini-bottles were gift from Albion when I bought Albion Excia AL Whitening Extra Rich Milk SV. It was for seasonal campaign.